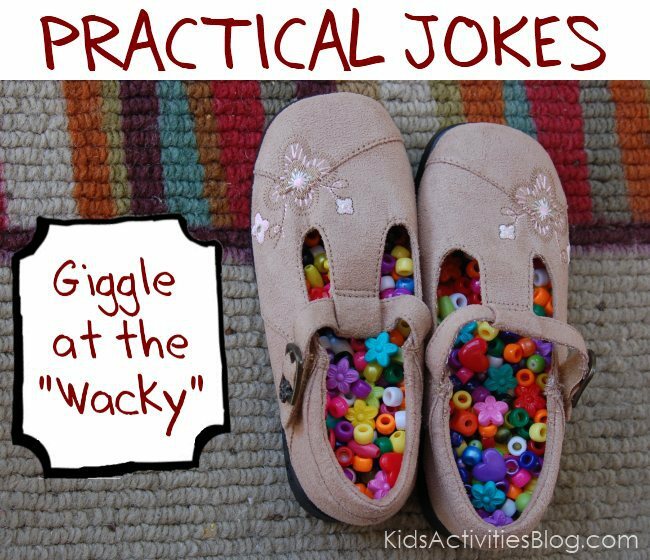 The kids completely light up when a practical joke is played on them. Developmentally, 3-6 year olds love to find things that are not “right”. 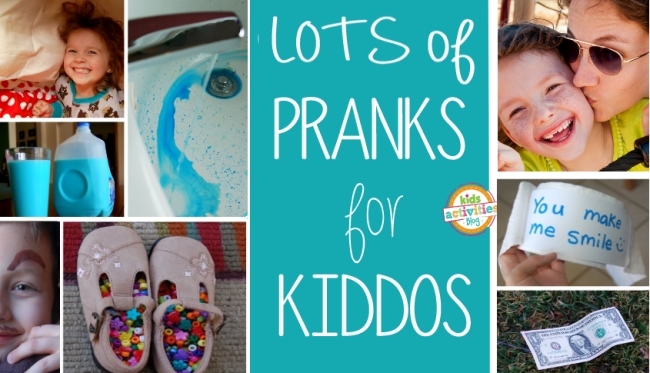 We have a list of 10 Kids April Fools Pranks – and below are a few of the other pranks we have done on our kids. Every couple of weeks, we have a Wacky Wednesday. Our day is loosely based on the book by Theo Lesieg. 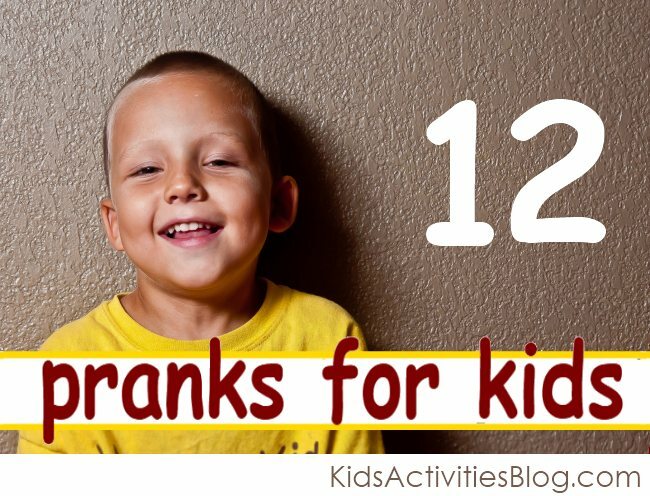 We do a couple of wacky pranks throughout the day and the kids try and find them. Put a sardine (small salted fish) in the door handle of the car – have baby wipes ready to wipe their stinky fingers afterwards. The kids will shriek when they open the car only to have a fish pop out at them!! Tape a bike horn behind the door, squishy side in – so the door slams into the horn. They will jump when the door “honks” at them. Do you have clear-ish plastic cups for the kids? Put a couple drops of yellow food dye in the bottom of the cup, then their favorite beverages change colors once the liquid gets in the glass. Give them a glass of vanilla pudding instead of milk for breakfast. Watch them try and drink it before handing them a spoon…OR Give them “juice” for breakfast that is actually jello – thanks Sarah for the second suggestion. Balance a cup of water on top of the bathroom door (must open into the bathroom). When someone closes the door, it hits the wall and falls off on them. If you don’t want a wet mess, consider using confetti. Dip a couple of drops of blue food coloring into the bristles of their tooth brush, as they brush their teeth will turn blue. Have an Easter egg hunt (even if it’s December), only super glue the eggs closed. Yes, we really did this. Be prepared with real eggs. Our kids were a bit disappointed by this one. This is a fun simple prank to do with your child. Super glue a quarter to the floor (we used the sidewalk outside our house) and see how many people try to pick it up. If your kids are like mine, they will be standing over the quarter explaining the prank to everyone walking by. This is a fun birthday prank, or a great “start” to a school break or other fun day. Balloon a door. Once your kids are in bed for the night close the door, put a trashbag over the door – taping it to the jam, fill the gap with balloons – when your kids open the door balloons flood onto them. Fill their shoes with pebbles or beads. I have seen this done with jelly beans too – but I don’t want the kids eating things that had contact with their feet. It is fun to see their surprise as they stuff their feet into their shoes. Make a special “dessert” lunch. Pound cake Grilled Cheese. Toast slices of pound cake to be the bread and use orange icing as the cheese. You will have some happy kiddos! Have you pranked your kids? What did you do to give them the gift of surprise?? I would love to hear about it in the comments!! I love these ideas! So much fun! Last year on the last day of school, some other moms and I sprayed our kids with water guns when they got off the bus. My 7YO still talks about it! I’ve heard the idea to prank our childs. You wrap the box that contains battery and card. And write this, “toys not included”. the best one I have done was..
Wow! This website is great for when I have sleepovers with my friends. All we do is prank my parents all night. I am only 11 years old but the pranks on here for parents to pull work great too! My husband and I attacked our kids with newly bought nerf guns as they walked through the door. We placed nerf guns for them just a few feet away from the door. The best April Fools I ever did for my Four kids was a treasure hunt. The clues were to lead them to the greatest gift known to man. Once they reached the treasure, they opened it to find a mirror and a note explaining they were the greatest gift and I was taking them out for ice cream. It was a great April Fools! Why don,t you do some that the KIDS can USE to PRANK THERE PARENTS. I’ll tie a fake spider (or some other furry/ fuzzy thing) to a piece of thread and then thumbtack it to the bottom of a partially open door.. They open the door, the critter runs across their path. Those same critters have also been known to “jump” out of cabinets when cabinet doors are opened..
Another fun, silly thing to do is ambush the kids with “snowballs” when they come into the house. Just use jumbo marshmallows instead of the real thing. You’ll be amazed at how much fun it is, with no harm done.. If you take a rubber band and attach it around the hand sprayer in the kitchen the kids turn on the water and it sprays them. The fun part is they get so frazzled that they can’t figure out all they need to do is turn off the water they keep grabbing the hose. BUT beware, I have done this and forgotten about the hose and went about my morning only to soak myself! It is fun! Especially when everyone wakes up and forgets it’s April fools. I have put an out of order sign on the bathroom door and they get really mad. I’ve also put a dirty sign on the dish washer when all the dishes were clean. I made jelly (jello) iin plastic beakers with a straw and gave them it to drink with their dinner. The children were thoroughly confused and then delighted and played for ages with the jelly making rude noises with the straws. Best 80p I ever spent, who says money won’t buy happiness? lol. Will be trying some more of these. These pranks are super funny. And they remind of Rebecca Wilson from Spy Kids. It was so funny when my mom thought she had lost her keys but I had them. It was also so funny in the hunger games when Rue stole Cato’s knife and then he blamed another tribute for it. It was so funny in Spy Kids 4 when Marissa thought she had the necklace but when danger opened it, he got baby food on his face. I wish I could play a prank like make my mom’s teeth blue but I would get in trouble. And it was so funny in the Spy Kids 4 deleted scenes, when the teacher turned around they saw a kick me sign on her back and everybody laughed. It was also so funny when Rebecca drew a mustache on the teacher’s photo and everybody laughed again. Finally, it was so funny the way the teacher’s stuff fell on top of her. It is just to funny. stuck and will still spray! ( = I really like this website! It is GREAT!!! Buy hamburgers for lunch or supper and remove the meat from each burger before serving. See how lone it takes for the kids to realize there is no meat in the burger. I did this with my kids when they were 10 and 11. As usual, a disagreement broke during the meal. My daughter reached over and pounded her brother’s burger with her fist. When he opened the bun to see why he tasted no meat, he said, “Kim, you squashed the meat out of my hamburger!” I almost never stopped laughing. As a kid I wouldn’t have enjoyed many of these. As a parent they make more mess. A good trick makes everyone happy, not aggravated or anxious. Love the ideas that involve a surprise but doesn’t make the kid feel like they looked bad. (Sweets disguised as food and vice versa, treasure hunt, etc). Please don’t prank sensitive kids. I’d stick with fun surprises, where things turn out better than expected and nobody is disappointed or made to look silly. If doing the other pranks I would want to have long discussions about things like only doing pranks for April Fools, the person who set it up cleans up, it’s not funny if it upsets people etc. I cut out E’s out of brown construction paper. I put them in a pan with tinfoil covering. I told them we had BROWN E’s. I then had a real on of brownies on stand by. Becki my teacher did that in 2nd grade it was so funny haha ? Thanks so much Maya for the feedback. I apologize that you were disappointed in the kids pranks.